Modern economists have consistently failed to predict and explain the business cycle. 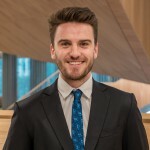 Mitchell Harvey argues that an old idea, long rejected by the mainstream economics profession, may be worth reconsidering. I think it is quite safe to say that macroeconomists are slightly baffled at the moment. Firstly, the GFC was a shock to most free market advocates. The horrors of recession and the perceived failure of capitalism convinced many that we need more government, not less. However, the post-GFC outcomes have been equally puzzling and there are still so many unanswered questions: If markets are efficient, where do bubbles come from? If inflation is ‘everywhere and always a monetary phenomenon’, why has it taken so long for inflation to pick up after Quantitative Easing programs? If stimulus programs work, why was growth so sluggish? Given the failure of the standard explanations, maybe its time to resurrect an idea that has been ignored by mainstream thought: Please enjoy my attempt to briefly explain the Austrian Business Cycle Theory (ABCT). All people depend on price signals to coordinate their behaviour. One of the most important price signals is the interest rate. The natural interest rate represents the intersection of the savings and investment curves and coordinates the time scale of investments. Basically, low interest rates allow for more ‘long term’ or ‘round-about’ projects. High interest rates lead to more ‘short term’ projects. A quick example would be useful here: Suppose you want to start up your own small business. In order to run this business, you need some office space. So, should you rent or purchase? The interest rate will be crucial in your decision. A low interest rate makes debt affordable. This might convince you to purchase. If interest rates are high, you will probably rent. Similarly, interest rates also coordinate capital consumption. Should you buy a car or keep catching public transport? Do you buy a house or do you keep renting? It might depend on the interest rate. So, low interest rates lead to long-term projects. Long-term investments require capital. 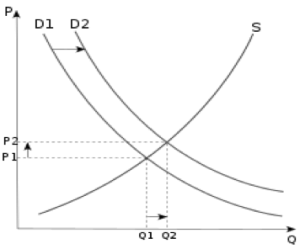 Hence, if interest rates are low, there will be higher demand for capital, so the price of capital increases. Higher prices incentivise production; so capital-producing industries will expand. In this graph we see what happens if households decide to save more. The supply of loanable funds shifts out to the right, which lowers interest rates. The consequence of lower interest rates is that capital is more affordable. This will in turn cause a shift outwards in the demand for capital assets. 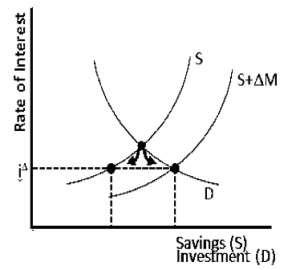 In this graph, we see how the lower interest rate leads to increased demand for capital assets. 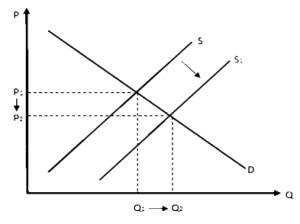 This in turn causes the price of capital assets to rise and the quantity of capital assets produced to increase. This is a sustainable increase because the increase in capital is resourced from increased savings and decreased consumption. Let us now introduce a central bank. Suppose the central bank increases the money supply and puts new money into the banking system. Firstly, interest rates will ‘artificially’ decline. This sends a false signal to investors that long-term investments are cheap. Simultaneously, it tells consumers not to bother saving and that they can buy a house. In this graph, we see the loanable funds market after an increase in the money supply from the central bank. The interest rate declines, just as it did earlier. However, households will actually save less (the first black dot from the left of the graph), while it appears to borrowers that there is an increase in the supply of loanable funds (the third black dot from the left of the graph). The gap between the first dot and the second dot consists of newly created money. Just as before (see Figure 2), demand for capital assets will shift outward, leading to an increase in production of capital assets. However, unlike before, this is an unsustainable increase in capital asset production. This increase is not backed by any real savings. If anything, consumption will increase and savings will decrease. This is what sets up the bust. It’s important to note that the newly created money won’t immediately generate inflation, because all the money is being funnelled into buying capital assets, causing capital asset prices to rise. Again, this causes increased capital production. All of this leads to the boom: The share-market picks up, debt increases, house prices accelerate and cranes dominate the skyline. It is only when the newly created money goes into the pockets of consumers that we start to see inflation – this time lag is a crucial element for this theory to make sense. Nevertheless, eventually the new money causes inflation in the prices of inputs and ultimately final products. Inflation leads to increasing production costs (wages rise, input prices rise) causing an unexpected profit squeeze. Suddenly, businesses feel like they need to borrow some more money to get through a rough patch. Simultaneously though, banks start getting nervous. If inflation is higher than interest, the banks will actually be losing money on their loans. So, they raise interest rates – just at the time when businesses are under unexpected pressure! Long-term projects are suddenly becoming unaffordable, so demand for capital assets grinds to a halt. Price growth slows, and then reverses. This causes the boom-time expansion of capital production to go into reverse and jobs are lost. Meanwhile, people who bought capital in the boom time suddenly hold assets that are worth less than the debt they owe to the bank! This brutal adjustment process inevitably leads to bankruptcies, failing financial institutions, and ultimately a recession. Does this all sound a bit familiar? The crash of 2007/2008 was preceded by a period of very low interest rates, a bubble in the housing market and an associated boom in the financial sector and stock market. Rising interest rates eventually popped the bubble, causing the GFC and all the ensuing chaos. It is important that we do not ignore ideas that are out of step with mainstream thought. By engaging with the ideas of the past, we can strengthen our knowledge of present theory and understand how economics has developed and evolved as a science. More importantly though, underneath the refuse of the bad economic ideas we throw away, we just might find a gem of brilliance that is worth dusting off and displaying in a new light. For what it’s worth, I think the ABCT is one of those gems. The outline of the original idea was suggested by Ludwig von Mises in his book The Theory of Money and Credit (1912). 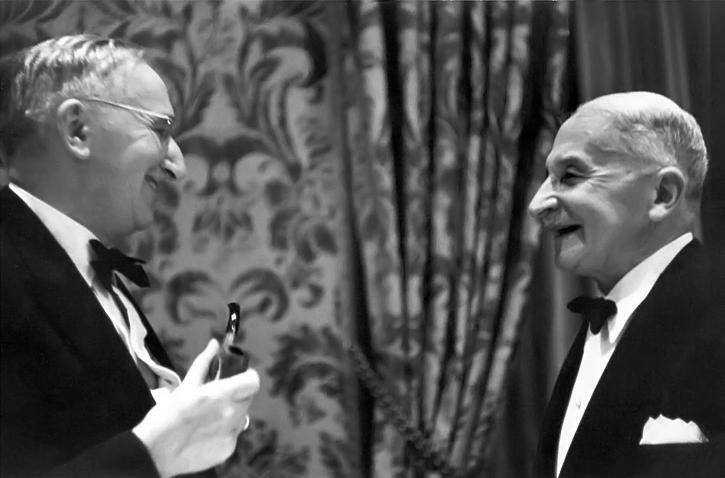 It was fleshed out by Friedrich Hayek in his book Prices and Production (1933). 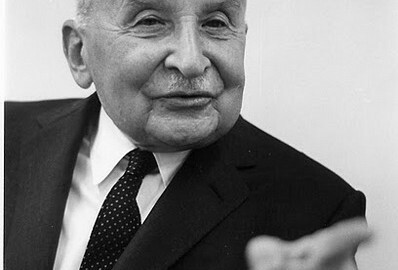 Mises developed the theory further in his later works, such as Human Action (1949). In recent years a number of economists, mainly concentrated at George Mason University, have attempted to re-enliven this theory and apply it to recent recessions. Balance sheet recessions: another economic fallacy?